Word-of-mouth endorsements are something that makes All-Type Welding and Fabrication proud. A current customer decided to expand their relationship with ATWF when they were unsatisfied with work from another vendor. With nearly 30 years of challenging welding and fabrication experience under our belt, All-Type Welding and Fabrication offers sophisticated processes and has the right team executing them. ATWF’s team of accomplished engineers worked with a prospective customer in the commercial industry segment to administer a manufacturing process for a custom aluminum weldment enclosure. Our engineers are former welders and, upon review, ATWF was chosen amongst competitors to complete the project. For more details on how this four-year project was executed, download the full Project Profile below. For more information about other products and services contact us. 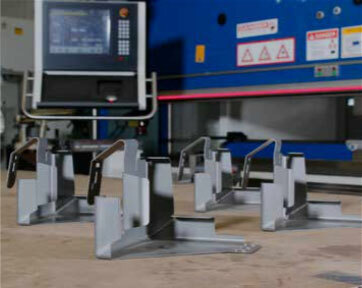 Quickly producing specialized weldments requires sophisticated processes and the right people executing them. After nearly 30 years of doing challenging welding and fabrication jobs, All-Type Welding and Fabrication, Inc. has the unique set of capabilities that gets jobs done right. One of the advantages of working with welding experts is their ability to anticipate problems and create solutions before they’re manufactured. They know what works and how to eliminate costly steps in the manufacturing process, saving significant dollars and man-hours over time. A prospective customer in a commercial industry needed to save time and money on the manufacturing process of a custom aluminum weldment enclosure. They needed it designed from the ground up using 5052-H32 aluminum at a thickness of 0.090“—indicating very close geometrical tolerancing. Due to the thickness of the material and demanding specs, the product required an elaborate weld fixture to control location and create heat distribution of the weldment. ATWF engineers started the prototyping process by listening to what the customer wanted and needed. They worked closely with the customer, asking questions to gain clarity and an understanding of the ultimate project goal and its technical demands. They made helpful suggestions to improve designs, always with an eye on controlling costs and meeting exact customer needs. ￼ Being former welders, the engineers at ATWF developed a design prototype that accounted for the complex welding requirements. 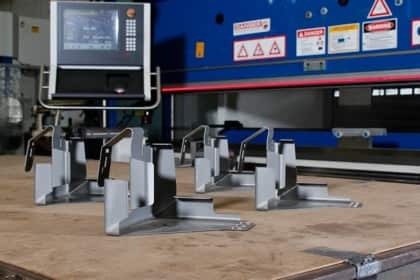 They ultimately created and tested a prototype quickly, completing feasibility testing and inspecting the quality of the weldment every step of the way. The speed of the prototyping process ensured the product was ready for production—and subsequently market—much more rapidly. With the working prototype proven and in hand, the customer had confidence to move ahead with production. ATWF’s inspection services played a key role throughout the build process. Welds, thicknesses, finishes and other elements were inspected and documented at every phase. Skilled technicians certified that the final product was crack- and defect-free before and after anodizing. The on-staff inspectors were backed by ATWF’s Helmel Microstar 430-252, a coordinated measuring machine (CMM) that meticulously measures geometric dimensioning and tolerancing (GD&T). All the tools ATWF used were also fully certified to ensure flawless production. Full inspection services included: CMM inspection, PIN gauges, chamfer gauges, thread gauges and surface roughness and material test reports. After each element was completed, it underwent a battery of tests and inspections to ensure quality. This weldment demanded tight tolerances. The finished product met every customer requirement, and was considerably faster to manufacture than the prior enclosure, saving time and money. The new enclosure was 3 pounds and measured 9.5” long, 8” high, and 5” wide. The biggest success was measured by feedback. The client was extremely satisfied with every aspect of production and greatly appreciated the time and money they saved during the manufacturing and fulfillment processes. If you have a vexing engineering problem or want to find ways to save time and expense in your manufacturing processes, contact All-Type Welding and Fabrication. Product Description An aluminum retaining weldment used within a commercial application. Overall Part Dimensions Material Thickness: 0.050" Width: 4.950" Length: 7.146" Height:7.100"
Tightest Tolerances ±0.015" Profile of 0.060" True Position of 0.014"